Visit My Book List for some great reading ideas! 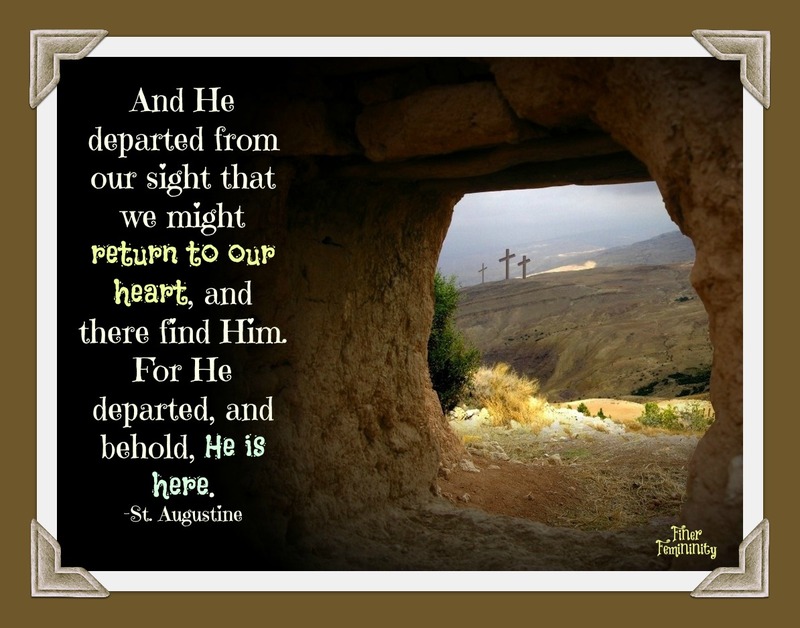 And a beautiful Good Friday prayer following…..
For the hours spent at home by those who cannot get to the rites of Good Friday, it is good to plan special activities in order to help all keep a spirit of recollection. With many little children, silence is almost impossible, but as they grow older, they begin to cooperate. Friends of ours have had their children make the garden of Joseph of Arimathea outdoors, separately, on Good Friday. They used whatever they could find at hand – stones, mosses, sticks, acorns. A drawing project will keep Peter occupied. Having said the Stations of the Cross during Lent, he applies himself seriously to illustrating them. Rereading the passages about the Passion will keep another child busy, read out of Scripture or from a favorite life of Christ. For a boy who is fidgety and must be active, a solitary chore that is a penance is better: perhaps cleaning the goat stalls or spreading hay and manure from the goose’s pen on the garden. I know many mothers who, because they must be at home with their babies during this time, save a task that especially tries them. Each has his or her way of best spending the hours of Good Friday, but it will work out most successfully if the program for the day is well planned. This was the great prayer of our Lord on the Cross. The family may divide itself and read the lines alternately. These words open my eyes, and I see clearly all that Your love has made You do for me. 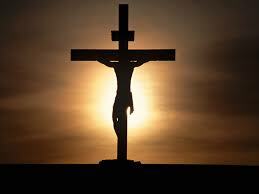 I see that You suffered during your life and death, O Man-God, suffered because of that profound, ineffable love. No, O Lord, it was not in jest that You loved me, but Your love is perfect and real. In myself, I see the opposite, for my love is lukewarm and untrue, and this grieves me very much. O Master, You did not love me in jest; I, a sinner, on the contrary, have never loved You except imperfectly. I have never wanted to hear about the sufferings You endured on the cross, and thus I have served You carelessly and unfaithfully. Your love, O my God, arouses in me an ardent desire to avoid anything that might offend You, to embrace the grief and contempt that You bore, to keep continually in mind Your Passion and Death, in which our true salvation and our life are found. O Lord, Master, and Eternal Physician, You freely offer us Your blood as the cure for our souls, and although You paid for it with Your Passion and Death on the Cross, it cost me nothing, save only the willingness to receive it. When I ask for it, You give it to me immediately and heal all my infirmities. My God, since you agreed to free me and to heal me on the one condition that I show You, with tears of sorrow, my faults and weaknesses; since, O Lord, my soul is sick, I bring to you all my sins and misfortunes. There is no sin, no weakness of soul or mind for which You do not have an adequate remedy, purchased by your death. This book, The Dolorous Passion of Our Lord Jesus Christ, has great meditations on the Passion of Our Lord! Coloring pages for your children. 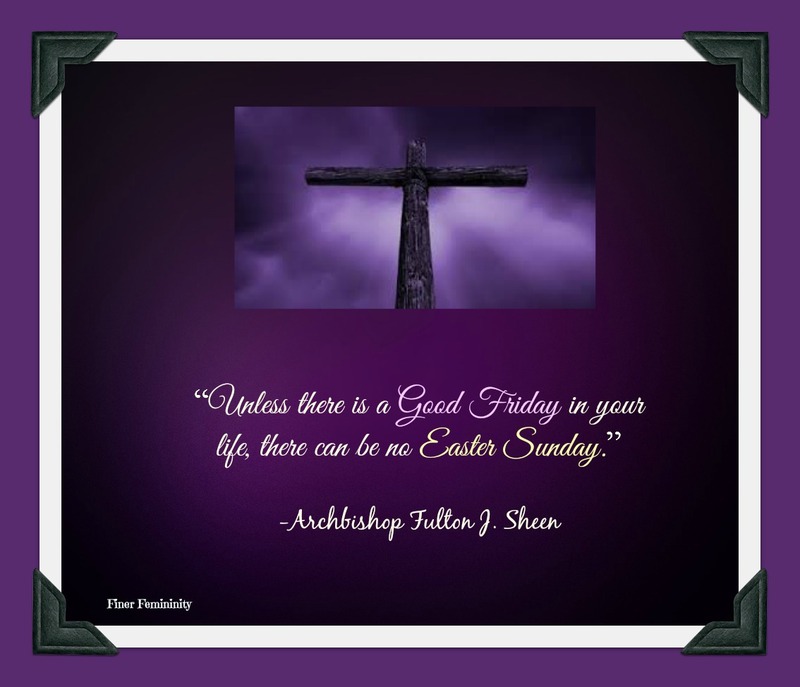 Click on the image to get full size…..
On Good Friday Holy Mother Church gives her children a beautiful opportunity for a profession of faith: the adoration of the cross. Behind the priests and altar boys follows the whole congregation. We remove our shoes when we go to adore the cross. Three times we prostrate ourselves as we come closer, until we finally bend over and kiss the feet of the crucified. As we, the church choir, follow right behind the priest, we sing during the rest of the adoration. Our songs are the heartrendingly moving “Crux fidelis” by King John of Portugal, and Eberlin’s “Tenebrae factae sunt,” of such haunting beauty. The priest consumes the Host that was consecrated the day before. On the anniversary of Our Lord’s death–the bloody sacrifice–the Church does not celebrate the symbol of the unbloody sacrifice. After the official service is finished, the altar is stripped again. The tabernacle is left open, no vigil light burns in the sanctuary. But in front of the empty tabernacle lies the crucifix on the steps of the altar, and the people come all during the day for adoration. In Austria another custom was added. At the end of the official service the priest would carry the Blessed Sacrament in a monstrance, covered with a transparent veil, and expose it on the side altar, where a replica of the Holy Sepulchre had been set up with more or less historical accuracy, with more or less taste, but always with the best of will. Like the crèche around Christmas time, so the Holy Sepulchre on Good Friday would be an object of pride for every parish, one parish trying to outdo the other. The people in Salzburg used to go around at Christmas time and in Holy Week to visit the Christ Child’s crib and the Holy Sepulchre in all thirty-five churches of the town, comparing and criticizing. There would be literally hundreds of vigil lights surrounding the Body of Christ in the tomb of rock, which was almost hidden beneath masses of flowers. There would be a guard of honor, not only of the soldiers, but also of firemen in uniform and of war veterans with picturesque plumed hats. I still remember the atmosphere of holy awe stealing over my little heart when as a child I would make the rounds of churches. There in the Holy Sepulchre He would rest now, watched over by His faithful until Holy Saturday afternoon. Here in America we have found another lovely custom: people going from church to church not on Good Friday but on Holy Thursday. On that day, the churches are decorated with a profusion of flowers, as a sign of love and gratitude for the Holy Eucharist. The contrast with the bare churches the day after, on Good Friday, is all the more striking and gives a tremendous feeling of desolation. Good Friday is a very quiet day with us. There is little to do in the kitchen, since fasting is observed rigorously on this day. We have no breakfast, and all that is served for lunch, on a bare table without tablecloth, is one pot of thick soup, “Einbrennsuppe,” which everyone eats standing up in silence. There is little noise around the house. Talking is restricted to the bare essentials, as it would be if a dearly beloved was lying dead in the house. As we are so privileged as to have a chapel in our house, we use the day when the holy house of God is empty and desolate to clean and polish all the sacred vessels and chalices and the ciborium, the monstrance, candlesticks, and censer. The vigil light before the picture of the Blessed Mother in the living room is also extinguished, because on Good Friday Christ, the Light of the World, is dead. From twelve until three, the hours of Our Lord’s agony on the cross, all activity stops. We sit together in the empty chapel before the cross and spend these hours in prayer, meditation, and spiritual reading. From time to time we rise and sing one or the other of the beautiful Lenten hymns and motets. On Holy Saturday, a new stir of activity starts in the kitchen. Eggs are boiled in different pots containing various dyes–blue, green, purple, yellow, and red. 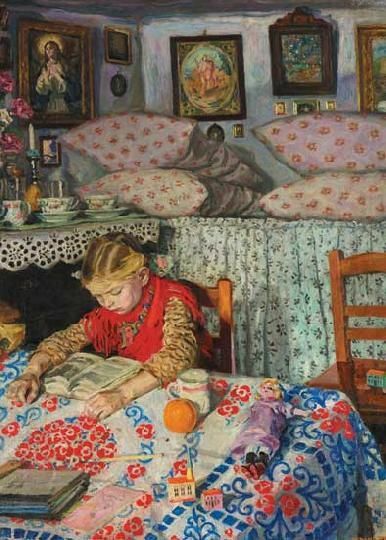 Every member of the household who wants to participate in this art takes some eggs to his or her room, after they have dried, to work on them in secret. One takes some muriatic acid with which she etches the most intriguing patterns out of the colored foundation. It is quite popular in our house to etch the first line of Easter songs–staves, notes, and words. Our cleverest artist sits with paint and brush, and under her fingers appear pictures of an Easter lamb, or of Our Risen Savior Himself, or of the Blessed Mother, or of the different patron saints of the family. Sometimes they turn out to be little gems. Others fasten dried ferns or little maple leaves or other herbs around the eggs before they are boiled in dye. When these leaves are finally taken off, the shape of the flowers and herbs remains white, while the rest of the egg is colored. This is easily done and looks very pretty. These eggs first appear on trays and in bowls on Easter Sunday morning at the foot of the altar for the solemn blessing of the food. Afterwards they will be distributed at the solemn Easter breakfast. If you have trouble reading saint books and find the story lines boring, you need to try these! We love these books and have had them on our book shelves for years! They are very well-written and make the saints come alive! Louis de Wohl has the amazing capacity to take historic Catholic figures and breathe life into them by creating a novel around what their life might have been like. They are meant for high school and adult level. Some of the books could have adult content, for instance, St. Augustine’s life before conversion. Parents may want to read them first. Now here is a strange thing. Here is a bewildering thing. Here is a downright dumbfounding thing. Christ the omnipotent, He who could say to a mountain, “Remove from here,” and it would remove – Christ no longer can carry His cross. Christ needs somebody to help Him to carry out His mission of salvation. Christ is falling, Christ is fainting, Christ is failing. Christ needs an assistant; Christ the rescuer of all mankind needs rescuing. And in this moment of shattering drama, does God send an angel, or a prophet, a flaming personality such as John the Baptist? No, God sends a man of whom nobody ever has heard. God selects a chance passerby to lift Christ’s burden and to walk beside Christ on the way to Golgotha. What mystery is this, that the most ordinary and casual onlooker is lifted to immortality, is chosen to lend his strength to the All-Powerful One when the All-Powerful One is helpless? Cannot the divine Christ, the healer of lepers, the giver of sight to the blind, the restorer of life to the lifeless, cannot He finish his work unless he is assisted by this Simon of Cyrene who has blundered onto the scene, and who, we may guess, has small taste for carrying crosses for condemned criminals? Mystery it is indeed; mystery of mysteries. It is as mysterious, this incident, as St. Paul’s remark about filling up in his own body what is wanting in the passion of Christ. What can possibly be wanting in the passion of Christ? Although we know that God could have repaired fallen human nature by a simple act of His Will, yet He demands for our personal salvation an act of our will, a cooperation with His grace. This is the mystery of human freedom, without which man is not really man at all. Man to be man must be able to make choices. Man to be what he is, the image and likeness of God, must distinguish between good and evil, and choose good. How else is man to have any dignity? How else is man to be like unto God? How else is man to be happy-for does not happiness consist in the knowledge that one has done the good that one ought to do, and avoided the evil that one ought to avoid? How can man share forever in the happiness of God unless he has identified himself with that happiness by freely choosing God and God’s way? It is like asking whether any of us can enjoy the beauty of a sunset without ever having gazed upon a sunset, or the lilting joy of symphony music without having listened to it. What the conductor of an orchestra feels, we cannot feel without sharing, according to our capacity, in his experience. We cannot have any of his happiness in music without ourselves entering into music. Neither can we enter into God’s eternal joy without choosing for ourselves the cause of that joy, which is God’s goodness. There are those who blindly complain about this; who would prefer that God force His happiness upon them without their doing anything to make themselves capable of it. But this is impossible. As well might we ask that we know the joys of love while refusing to love; or the pleasure of knowledge while declining to learn. If you do not know a single word of English, and resolutely refrain from acquiring any English, it would be foolish of you to complain because you cannot enter into the joy of reading Shakespeare in his own tongue. You are simply incapable, through your own choice, of sharing in the experience and the insights of Shakespeare. Thus it is with God and man. Christ has opened the door; Christ has led the way; Christ has given us all the means for fitting ourselves for the happiness of heaven. But if we turn our backs, if we walk the other direction, if we reject the means, then we shall find that with respect to God’s happiness, we are like blind men trying to enjoy the sight of flowers, we are like the deaf wanting to listen to music, we are like paralyzed persons longing for dancing and the poetry of movement. We must do our part. We must lift a burden as Simon lifted; we must walk with Christ as Simon walked. We must fill up in ourselves, as St. Paul filled up, what is wanting of the passion of Christ. The point is that what is wanting in the passion of Christ is my little bit, and your little bit. In one sense, Christ climbed alone to Calvary. In another sense, He climbed in the midst of a countless multitude of other climbers, each carrying his own little cross, his own little duty, his own contribution to the unselfish immolation of love. The passion of Christ took place at a certain time and in a certain place; but it extends backward to Adam and Eve, and forward to the last man and woman. What we ought to see when we contemplate Christ’s sacrifice is not the sacrifice of Christ alone, but the sacrifice of Christ expanded into countless other hearts and souls. This is the meaning of the Mystical Body of Christ; this is the meaning of the Church. The Church is Christ saving all of us by enlisting our willing cooperation. The Church is Christ and you and I and a vast concourse of others, indomitably struggling upward and onward toward the death that is the opening into life everlasting. 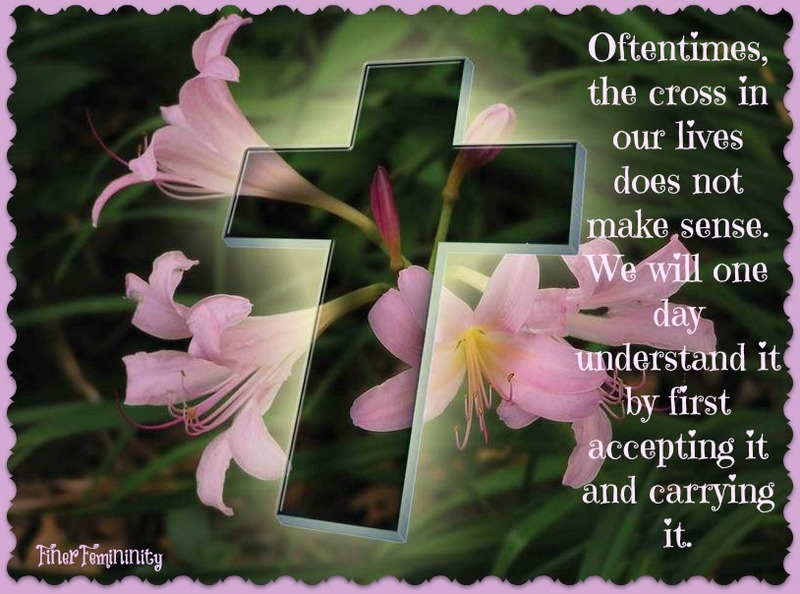 Every last one of us is, or ought to be, a Simon of Cyrene, walking through life with Christ, enduring bravely life’s vicissitudes and keeping our eyes always on the goal until it is achieved. Unless the Simons do their part, the Simons cannot accomplish what Christ gave them the power to accomplish. All this is a mystery, and yet it ought to be as plain as a pikestaff. Let us express it in this manner-the confessionals are always open, and guilt can be blotted out of our souls in an instant, but not if we will not enter the confessional. And even if we enter the confessional, nothing is accomplished without contrition. Nobody else can be contrite for us; we ourselves must turn from evil to embrace good. The instant we do that, we become capable of the life of God which is the life of love and goodness; we begin, in fact, to share God’s supernatural life on earth. We have a foretaste of eternal joys; we enter into an anteroom to heaven. But as long as evil is what a man loves, then what he loves is not goodness, and he cannot know the happiness that comes of goodness embraced. To make a homely comparison, if I cannot abide the taste of olives, then olives cannot give me pleasure. If I want the pleasure that olives give, I must change. And if I am to share the happiness of God, then I must fit myself to be happy by God’s happiness; I must become like God. I must determine to be a Simon of Cyrene who will be ready to walk with Christ and not to turn away from Christ. Simon might have been a lover of comfort who would have so weakened his body with self-indulgence and luxury as to have been incapable of lifting the weight of Christ’s cross. He was fit for Christ, when the test came, because his muscles were strong, and his soul willing. To each of us comes our moments of Simon-likeness, when we are called upon to do our bit in sharing the passion of Christ which leads to resurrection and glorification with Christ. It is our duty and our high privilege to be always prepared. What happened to Veronica’s veil was simply an outward expression of what happened in Veronica’s soul. Are we “Veronica’s” in our everyday life? Do we seek to serve, to encourage, to listen….? According to an old tradition, the first three days of Holy Week– Monday, Tuesday, Wednesday–are dedicated to spring cleaning. In the days before the invention of the vacuum cleaner, this was a spectacular undertaking: sofas, easy chairs, and all mattresses would be carried out of the house and beaten mercilessly with a “Teppichpracker” (carpet-beater). Walls were dusted, curtains were changed–a thorough domestic upheaval. There is little time for cooking, and meals are made of leftovers. By Wednesday night the house looks spick and span. And now the great “Feierabend” begins. “Feierabend” is an untranslatable word. It really means vigil–evening before a feast, the evening before Sunday, when work ceases earlier than on any other weekday in order to allow time to get into the mood to celebrate. From now on until the Tuesday after Easter no unnecessary work will be done on our place. These days are set aside for Our Lord. On Wednesday, with all the satisfaction of having set our house at peace, and after the dishes of a simple early supper are finished, we go down to the village church in Stowe for the first Tenebrae service. In the sanctuary, a large wrought-iron triangular candlestick is put up, with fifteen dark candles. We take our places in the choir, and the solemn chanting of matins and lauds begins. This is the first part of the Divine Office, which has been recited daily around the world by all priests and many religious since the early times of the Church. In the cathedrals and many monasteries it is chanted in common. For the last days of Holy Week, it is performed in public, so to speak–not only in cathedral churches, but in any church, so that the faithful may take part in it. Matins has three nocturnes, each one consisting of three psalms with their antiphons and three lessons. The first nocturne is always the most solemn one. We sing all the psalms on their respective “tonus”. We sing the antiphons, some in Gregorian chant, some from the compositions of the old masters such as Palestrina, Lassus, Vittorio. The lessons were sung last year by Father Wasner, Werner, and Johannes. In the second and third nocturne we only recite the psalms in “recto tono” in order not to make it too long. Some of the antiphons and all of the lessons, however, are sung. After each psalm the altar boy extinguishes a candle, reminding us of how one Apostle after the other left Our Lord. Matins is followed by lauds, consisting of five psalms and antiphons which we recite. At the end of lauds there is only one candle left–the symbol of Our Lord all by Himself crying out, “Where are you, O My people!” And we, in the name of all the people, recite now the “Miserere,” the famous penitential psalm, while the altar boy is carrying the last candle behind the altar and the church is now in complete darkness. The congregation is following closely with booklets in which the whole service, which we sing in Latin, is given in English. This is the most moving evening service of the whole year. When we sing “Tenebrae factae sunt,” an awesome silence falls upon the whole church, and when we sing the famous “Improperia `Popule meus'” by Palestrina we all are moved to the depths. The Gospel of this day tells of the lesson Jesus gave us in brotherly love and humility as He first washed the feet of His disciples, afterwards saying: “Know you what I have done to you? You call me Master, and Lord; and you say well, for so I am. If then I being your Lord and Master, have washed your feet; you also ought to wash one another’s feet. For I have given you an example, that as I have done to you, so you do also.” Therefore, in all cathedrals and abbey churches the bishops and abbots go down on their knees on this day after Holy Mass and wash the feet of the twelve oldest members of their communities. It is wonderful that in our days more and more parishes are adopting this beautiful custom, which brings home to us better than the most eloquent sermon that we should remember this word of Our Lord “For I have given you an example, that as I have done to you, so you do also,” which should become increasingly the watchword in our daily life. This is what the Church wants us to take home with us on that day the attitude of washing one another’s feet; and, because we Catholics have not awakened to this fact, we are rightly to be blamed for all wrong and injustice and wars going on in the world! As Good Friday has no Mass of its own, but only the “Mass of the Pre-Sanctified,” an extra big host was consecrated by the priest during Mass on Holy Thursday, which is put into a chalice and covered up with a white cloth. This chalice is now incensed immediately after Mass and carried in solemn procession to the “Altar of Repose,” while the “Pange Lingua” is chanted solemnly. This repository should remind us of the prison in which Our Lord was kept that terrible night from Thursday to Friday. Unlike that first night, where He was all alone after all the Apostles had fled, the faithful now take turns in keeping watch. 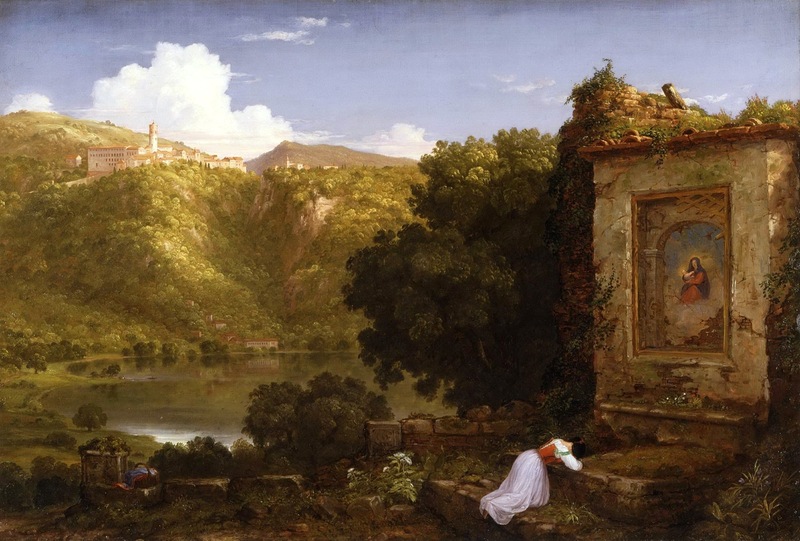 There is an old legend circulating in the old country, still fervently believed by the children, that all the bells fly to Rome on Holy Thursday, where the Holy Father blesses them; they return in time for the Gloria on Holy Saturday. My son Werner is living with his family just a little way down the road. When his little boys, Martin and Bernhard, are big enough to shoulder the responsibility, their father will make them such an old-world “Ratschen” and their mother will teach them the rhyme going with it. In the house also, the bells have to be silent. The bell rung for the meals or for family devotions is replaced by a hand clapper worked by the youngest member of the family, who announces solemnly from door to door that lunch is ready. Holy Thursday has a menu all its own. For the noon meal we have the traditional spring herb soup (Siebenkraeutersuppe). The mixture of the above herbs should total about 7 ounces. Whether bought at the market or picked, they should be washed well. Steam in butter with finely chopped onions and parsley. Press through a sieve into a flour soup and let it boil. You may put in one or two egg yolks, one to two tablespoons of cream, or 1/4 cup milk. You also may use sour cream. Afterwards there is the traditional spinach with fried eggs. In Austria, Holy Thursday is called “Gruendonnerstag” (Green Thursday). Many people think that the word “gruen” stands for the color, but this is not so. It derives from the ancient German word “greinen,” meaning “to cry or moan.” Nevertheless, “Gruendonnerstag” will have its green lunch. The evening of Holy Thursday finds us in our Sunday best around the dining-room table. Standing, we listen to the Gospel describing the happenings in the Upper Room. On the table is a bowl with “bitter herbs” (parsley, chives, and celery greens), another bowl with a sauce the Orthodox Jews use when celebrating their Pasch, and plates with unleavened bread (matzos can be obtained from any Jewish delicatessen store, but can also be made at home). Mix salt, flour, and egg (and butter). Add the water, mix dough quickly with a knife, then knead on board, stretching it up and down to make it elastic until it leaves the board clean. Toss on a small, well-floured board. Cover with a hot bowl and keep warm 1/2 hour or longer. Then cut into squares of desired size and bake in 350-degree oven until done. Afterwards the table is cleared and in front of Father Wasner’s place is put a tray filled with wine glasses and a silver plate with unleavened bread. While breaking up portions of bread, he blesses the bread and wine individually and hands it to each one around the table and we drink and eat, remembering Our Lord, Who must have celebrated such a “love feast” many times with His Apostles. This was the custom in His days; just as we in our time will give a party on the occasion of the departure of a member of the family or a good friend, the people in the time of Christ used to clear the table after a good meal and bring some special wine and bread, and in the “breaking of the bread” they would signify their love for the departing one. The first Christians took over this custom, and after having celebrated the Eucharist together, they would assemble in a home for an “agape,” the Greek word for “love feast.” To share bread and wine together in this fashion therefore, was not in itself startling to the Apostles, but the occasion was memorable on this first Holy Thursday because it was Our Lord’s own great farewell. Every Holy Thursday night spent like this knits a family closer together, “careful to keep the unity of the Spirit in the bond of peace, one body and one Spirit…one Lord, one faith…” as St. Paul wrote to the Ephesians. Coloring pages for Holy Week…. Catholic Young Lady’s Maglet (Magazine/Booklet)!! Enjoy articles about friendship, courting, purity, confession, the single life, vocations, etc. Solid, Catholic advice…. A truly lovely book for that young and not-so-young single lady in your life! Available here. There are parents who in regard to their children are very delinquent in the necessary vigilance. They are like the idols mentioned in the Bible: “They have mouths and speak not; they have eyes and see not; they have ears and hear not; they have noses and smell not; they have hands and feel not; they have feet and walk not” (Ps. 113, 6, 6, 7). Their children practically do as they please, without let or hindrance of their parents. They go where and with whom they like. They stay out as long as they choose. They read whatever they fancy. When, then, they become involved in some scandal, say the son or daughter becomes an unwedded father or mother, the parents throw up their hands in horror. They grow terribly indignant, and exclaim that they cannot understand why such a disgrace should ever have befallen their family. But often they are more guilty than the child. They were mature in years and had the experience of life; had they watched properly and prudently over their children, their going and coming, and had they used kindness and firmness upon them according to their needs, the lapse would likely have been avoided. After it has taken place it is too late to wax indignant. When the girl is in dire distress, and faces ostracism and disdain on the part of the cold and cruel world, and that from many apparently respectable people who in their private lives may be immensely worse than she has been, it is not the time for her parents to increase her mental tortures by apathy and severity, and thus perhaps to drive her to a worse crime than her first offense, namely to abortion and, possibly, suicide. But then it is the part of sensible and conscientious parents to take her back to their hearts in warm and generous sympathy, forgiveness and love, and to tender her in her delicate condition every protection and assistance. Of course, if without any recourse to sinful practices the matter can be kept secret, it must be done for the girl’s and the family’s sake. If it cannot be concealed, the girl and the family should bear the consequent disgrace with humble patience and resignation to God’s providence, and in the spirit of compunction and atonement for sin. There are many worse sins done in public and in private, which the world does not visit with its scorn and excommunication, but which are nevertheless grosser and more damnable in the sight of God. Whilst the parents are often as much or more at fault than the child that goes wrong, it must yet be admitted that sometimes the best parents, in spite of all their good efforts in the interest of their children’s education, are afflicted with a wayward child that brings shame upon the family and overwhelms the hearts of the parents with bitterness. This is one of the mysteries of the inscrutable providence of God, which it is given us devotedly to adore, but never to fathom in this life. Still it is good for all parents to remember that eternal vigilance is the price they are asked to pay for the welfare and felicity of their children. In addition to this it is consoling for good parents of bad children to reflect that, even as the winter wheat that is covered with snow seems hopelessly dead and gone, but soon comes to view again under the sun’s glow, so, too, a boy or a girl that has grown bad, and appears to be desperately lost to virtue and to God, is of a sudden touched by God’s grace and the warmth of the parents’ love, and rises and thrives again unto goodness and holiness of life. Photo: Solemn Mass of Exposition for the Forty Hours’ Devotion on March 12, 2013 at the Oratory of St. Philip Neri in London. New items at Meadows of Grace! Stop by and take a peek! It was a short mission talk ….shorter than any mission talk I have ever attended…(and I still fought to stay awake…yipes!) …yet it touched me and so I thought I would share the four points with you, mixed with a little of my own thoughts. The first point is confidence. We must pray with confidence! 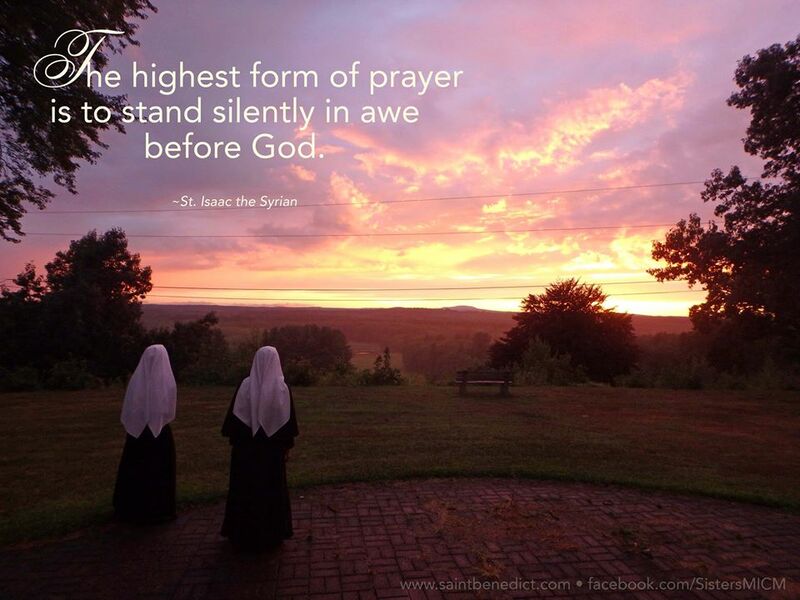 God is our Father….why do we pray with hesitancy, expecting NOT to have our prayers answered? Confidence pleases Our Lord very much! This was a blessing for me to hear. Most of the time, when I pray, I don’t have the confidence that would be pleasing to Him. So I have revved it up and am working on really EXPECTING God to answer my prayers! I told Vincent about the talk (he was working late, so he couldn’t attend) and we especially talked about the confidence part. The next evening he told me he went to Mass that morning and prayed WITH MUCH CONFIDENCE for some financial stress to be relieved. By the end of the day he was quite astounded at the way God answered him so quickly! 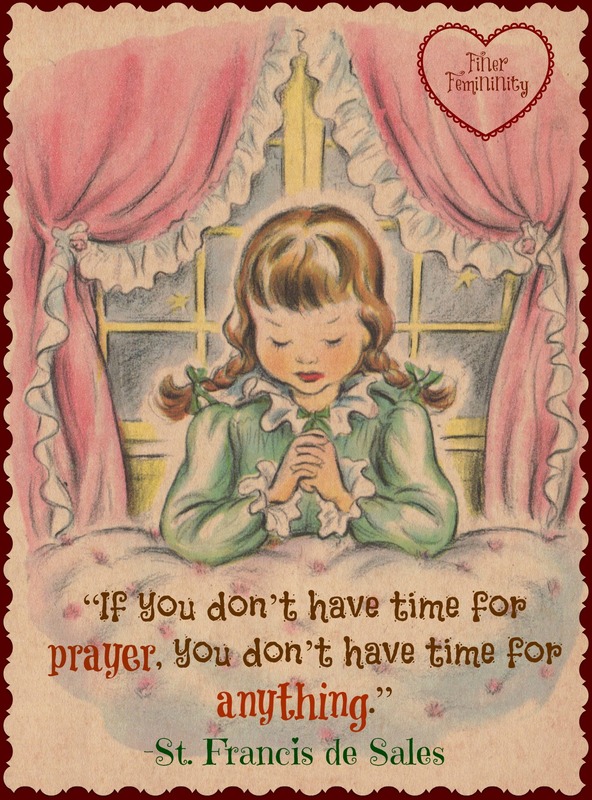 So….let’s pray knowing that God will answer our prayers! We’re not always sure how, or what His timing will be, but He WILL answer them. Something so basic and yet we seem to forget it, don’t we? The second point is Urgency. This really spoke to me. When we think of something to pray for, let us not put it off and think, well I will include that in our rosary this evening (which is a good thing, too) or I will remember it in my night prayers. NO! Pray for it that second. Send those little prayers up to God like little shooting darts of loving petitions! I thought this was awesome as there are SO many things and people to pray for, isn’t there? We can do it the instant we think of it and God listens to each and every one of those prayers! Wonderful! The third point is Simplicity. We don’t have to have elaborate prayers. God wants our prayers to be from the heart. Those little heartfelt prayers of our own are dear to Our Lord. And those potent and short ejaculations, like…… Jesus I trust in Thee…. Jesus, meek and humble of heart, make our hearts like unto Thine….Sweet Heart of Mary, be my Love….. Sweet Heart of Jesus, be my Salvation…are very powerful! The fourth point is perseverance. Oh my! There are certain things in my life…..loved ones, especially…. that I have been praying about for years. A couple of the situations have not turned out well. Do we get discouraged? Well….yes. Is that right and good? No! God, in His mercy, answers every prayer. Even though, with human eyes, things don’t look like they have turned out well, or our prayers seem like they have not been answered, we must keep praying. This was good for me to hear. I know it in my head. I had to hear it again to get it back in my heart. Confidence, Urgency, Simplicity and Perseverance! So simple, so profound! Coloring pages for your children….. The Little Flower Prayerbook is a vintage manual of prayers combined with a treasury of St. Therese\’s spiritual writings that showcases the wisdom and contemplation she achieved in her short lifetime. Originally published in 1926 A Carmelite Manual of Prayers is an introduction to the time-honored Carmelite prayers and devotions that St. Therese herself practiced during her lifetime. High School and Secret Company-Keeping – 1955, Fr. Donald Miller, C.SS.R. Too Young to Keep Company? I am 14 years old, a sophomore in high school, and I have a boy friend who is 16. We go out together twice a week, sometimes more often. My mother tells me I’m too young to be keeping company like that, but all the kids are doing it. I can’t see that there is anything wrong with it. Is there?